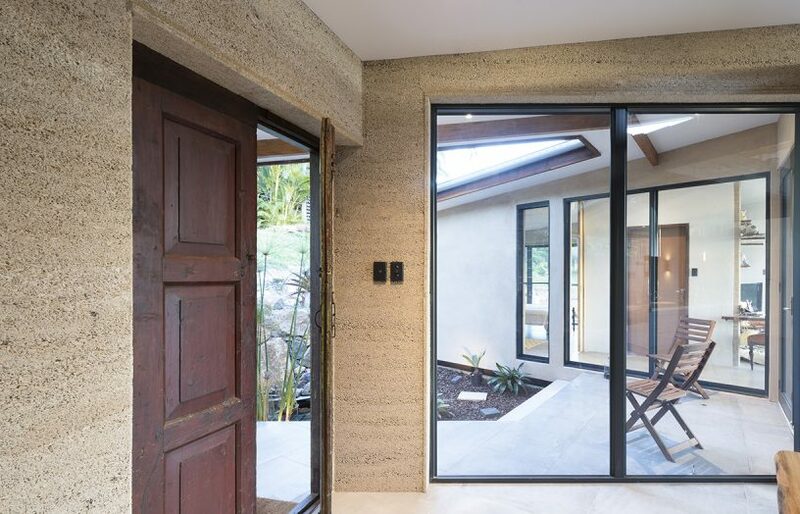 Recycled timber can be a beautiful feature in a new build or renovation – but there’s quite a bit to get your head around when deciding how best to use this valuable material. Once upon a time only ‘alternative’ architects and owner-builders were motivated to feature recycled timbers in construction projects. Before the 1980s, a load of chunky hardwood beams from a woolshed demolition was more likely to be burnt than carefully de-nailed, re-milled and given centre stage. Fast-forward three decades and the value seen in old wood has completely changed. High-grade recycled timbers are now premium products, valued for their density, sustainability and character. Access to timbers harvested from the world’s old-growth forests is severely restricted – for many species the only responsible way to purchase them is second hand. And waste management is improving as the demolition and building industries become better at diverting materials from landfill (although they are still far from perfect). Those ‘radicals’ who first made the effort to de-nail all those floorboards could be described as visionaries. 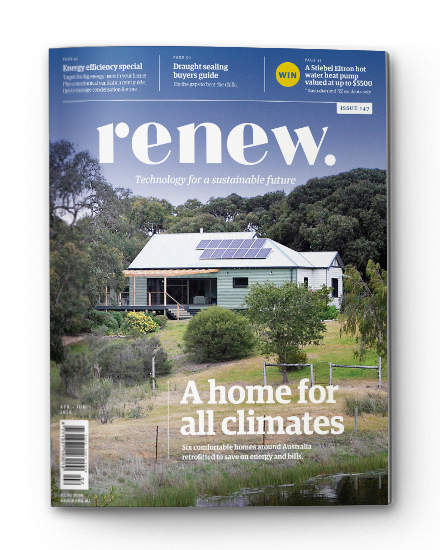 And many are now behind the impressive network of demolition and timber-recycling yards dotted around Australia, with organised racks of beams, posts and floorboards painstakingly prepared for the building and renovation market. Despite the industry growth, recycled timbers stubbornly defy real commodification. Building with recycled timber is more like collecting antiques than buying Lego blocks. It pays to be flexible and to develop good relationships with reputable recyclers. For domestic building projects, there are important issues to consider including supply, design and workability. On top of that, contemporary tastes increasingly place a premium on building materials with history, authenticity and a story to tell. “Recycled timbers are unique. They offer warmth, character and features you can’t get any other way,” says Mandy Donchi of Nullarbor Timber. Dressed, furniture-grade recycled timber in the rack at Nullarbor Timber. Recycled timbers are materials that have had a prior end-use, perhaps as flooring in a house or as beams from an old railway bridge, and the process of recovery and preparation is often labour intensive. 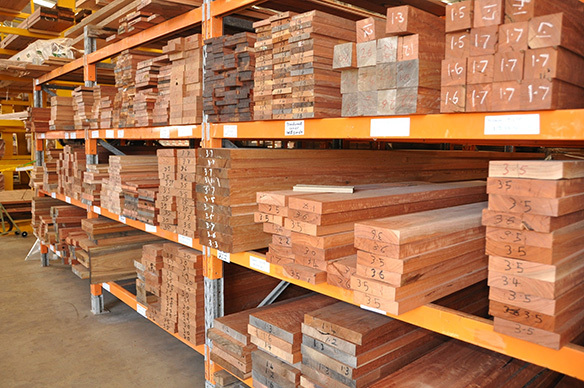 In Australia, much of the recycled timber market focuses on local hardwoods such as blackbutt, jarrah and stringybark that are prized for their density and colours. There are also large quantities of long-ago imported material such as Baltic pine and French oak. Some dealers now import recycled timbers from offshore, including China and Indonesia, but we would advise very close scrutiny of such offerings. 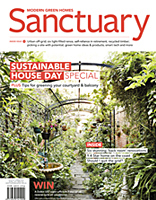 The construction industry prioritises volume and consistency in materials, which is somewhat at odds with the reality of recycled materials: “If clients want 180 square metres of a particular size of hardwood floor for their new home, it will generally be manually lifted from three or even five house lots,” explains Andy Mineur of Urban Salvage. “We try to be sympathetic with tone and vibe which is sometimes possible, but not always.” The maturation of the local timber recycling trade is based on an organised approach to such laborious work, but the supply is still finite, and the trade-offs mean that plenty of lower-valued lots still go to landfill. 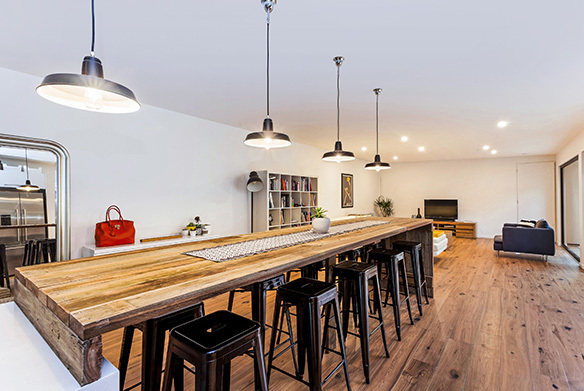 Premium prices for recycled Australian hardwood timbers, including bridge timbers like spotted gum and ironbark, appear to be a major factor ensuring recycled timbers re-enter the building market. Expensive tip charges are also reducing the amount of reusable timber being dumped in landfills. Detailed statistics on the size of the recycled timber market just aren’t available. A 2013-2014 Sustainability Victoria market report gives some perspective, though. About one-third of the 505,000 tonnes of timber waste that was generated in that state over that period was diverted from landfill. Less than half of that diverted material was re-used; and the vast majority was for low-grade uses such as packaging and mulch. Terminology is rarely consistent, so keep your brain switched on. ‘Recycled timber’ has had a previous life in another construction: beams in an old barn for instance. Recycling involves re-deploying the timber in a roughly similar application – without significant changes to cross-sections, but often a lot of effort is expended on preparation such as removing bolts and nails. Much of the character of such material derives from all the bolt and nail holes and distressed marks. ‘Re-milled’ timbers are recovered from large-dimensioned lengths and then dressed and cut into smaller cross-sections and consistent sizes for new applications. French oak wine barrels, for example, which are re-milled and used for floorboards. ‘Reclaimed’ timber is generally from urban demolitions or even old piers. ‘Salvaged’ can be quite ambiguous: it may be simply recycled, or it may be 200-year-old fallen habitat trees that have been pulled from paddocks and rivers. Certification isn’t a reality for recycled, re-milled or reclaimed timber materials. 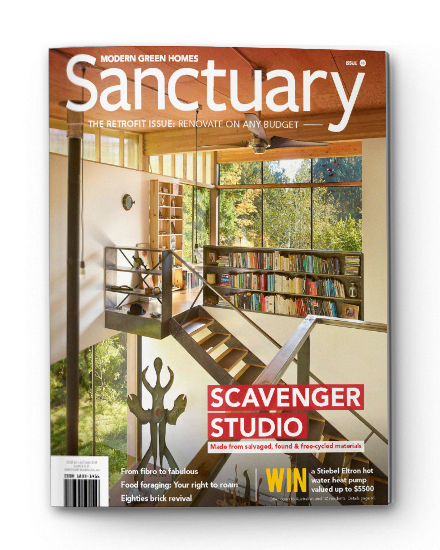 While the Forest Stewardship Council offers certification that could technically be relevant, even reputable dealers rarely apply it to recycled materials. The best way to build confidence that your timber actually is recycled is to critically assess the ‘chain of custody’ with your supplier. Legitimate dealers will know where they sourced the material from, and will know the exact woolshed, factory or house demolition. If you don’t see nail holes and other scars on recycled timber you would likely need to question how it was possibly used so carefully in the past. And if you can, sense-check with a builder; material such as shiplap spotted gum cladding is just not available as a recycled product, it can only be sourced new (make sure it’s certified for sustainability). Flooring is one of the major uses for recycled timber. Floorboards are commonly reclaimed in ‘lots’ from urban demolitions. Reputable recycled timber dealers will be able to provide detailed information about the quantities available, the species, previous use, and details such as whether it was previously protected by carpets. It’s not recommended to buy materials that have been water soaked or stored outside; and be aware of ‘mixed’ packs of floorboards that are sold as one house lot. Re-milled boards from recycled structural timbers are also on the market and have very consistent dimensions. These timbers are collected from a diversity of sources and when laid as floorboards the variety can look stunning. Re-milled timber is a ‘new’ product, and should be graded in line with the Australian Standard, so it is worth getting your head around terminology such as ‘standard and better’, ‘over grade’ and ‘run of the mill’. Typical floorboard timbers in circulation now include blackbutt, ironbarks, tallowwood, jarrah, Tasmanian oak and Baltic pine. Always personally inspect the product being offered in order to judge its suitability in appearance for your project. Ask for a sample, don’t rely solely on verbal descriptions and be warned, product names can be ambiguous. Can I use recycled timbers structurally? Yes – but the general consensus is that it isn’t worth it for any structural elements of a building that are hidden from view. For hidden structure, steel and sustainably sourced plantation engineered products may be a better choice. 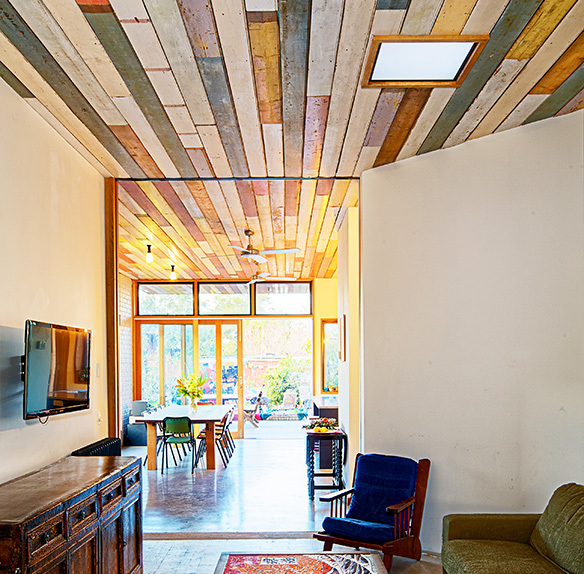 Recycled structural timber is relatively difficult to work and adds time and cost. Engineering computations to confirm structural sufficiency are normally based on grading associated with readily available new materials. Professional builders have responsibility for the structural integrity of what they build for a decade or more, and will want structural timber graded. Experienced building inspectors will also need independent third party certification of visually graded recycled materials. For these reasons, structural use of recycled timbers can be more easily justified when they are in full view – and of course, the right timber can really ‘make’ a space. 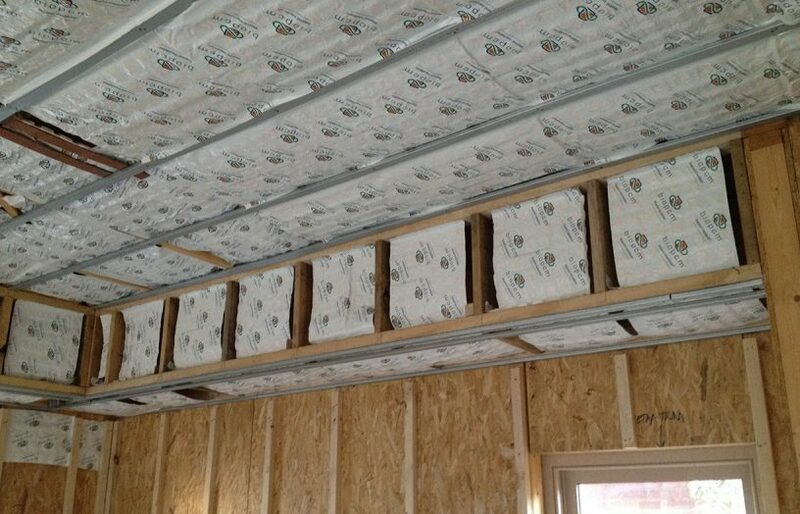 Structural timbers will carry an ‘F’-rating that relates to the load the timber can carry. The numbering system is somewhat arcane, but basically the higher the rating the higher the strength. These ratings are also relevant to recycled timber, and there is an interim standard in place for this. These ratings for recycled materials are not an exact science, and may be less relevant for recycled materials that are massively over-engineered for their purposes, such as enormous beams used for a pergola. Where there is a structural requirement, some recycled timber suppliers will supply timber with an independent stress grading, for a small extra fee. Recycled timbers used as features or as timber ‘accents’ can add warmth and character to a room or façade and is an increasingly popular way to use recycled timber. Typical uses include kitchen benchtops, internal lining and feature beams. While we’re not including details here about furniture-grade timbers, recycled timber for furniture represents an enormous proportion of the market. The best recyclers, or a collaborative designer, will be able to assist with identifying unique timbers and how best to put them to use. As with strength, it is important to understand the durability of timbers. Timber species are generally grouped into durability classes, which relates to their weather resistance and susceptibility to fungus, rot, and insect attack. A class 1 species will likely last longer outside than a class 2, and so on. 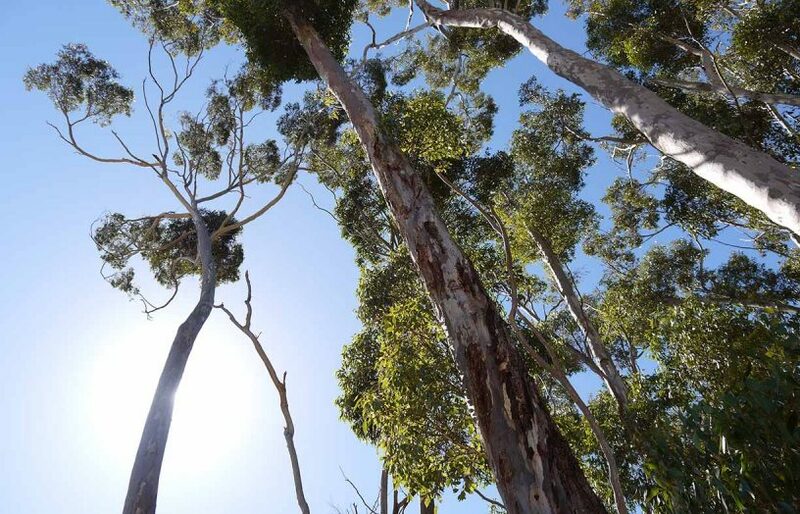 Examples of class 1 timbers include ironbarks, spotted gum and tallowwood; class 2 includes blackbutt, stringybarks and jarrah. Decks are often the most exposed part of a building and many recycled timbers, particularly those species native to Australia’s southern states, may not be suitable. In general, decking timbers are guaranteed to last around 10 to 20 years; on these numbers some people argue that decking is not the most sustainable use for any timber. In addition, many recyclers are reluctant to re-saw boards into narrower dimensions for decking due to its lower perceived value. Instead, a common choice for decking is new, sustainably sourced class 1 timber, such as spotted gum. Composite materials are also an option. 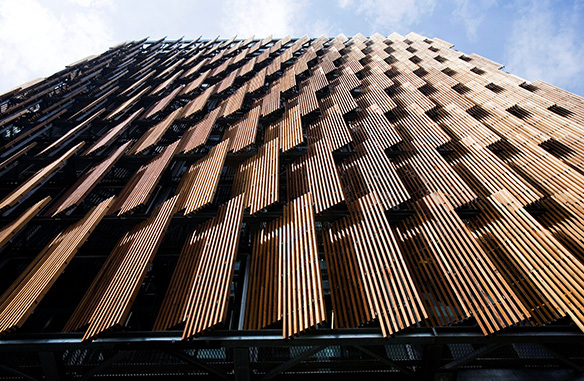 Recycled timber cladding is more common than decking, and high-class recycled timbers can provide an attractive patina or weathered appearance that is organic and beautiful. Approximately 20,000 lineal metres of 4”x 2” house frame timbers were used for the City of Melbourne CH2 Project. Approximately 270,000 old and rusty nails were removed by hand. Nullarbor Timber re-milled and re-dressed these timbers and provided this photo. Will all tradies work with recycled timber? You may have heard people speak about builders that won’t work with recycled timbers, due to the perception it is all rusty nails and knot holes. This still happens but is less common than it used to be. 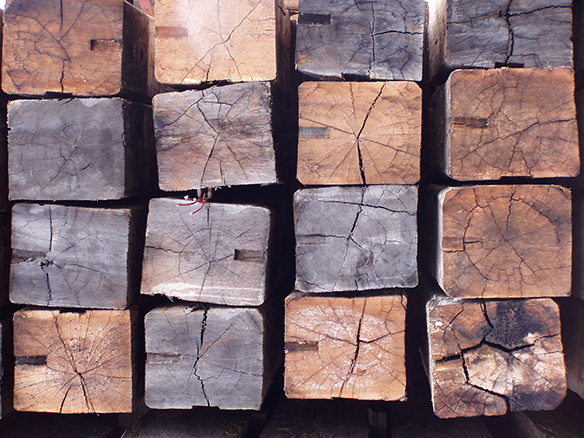 Old seasoned timber can however be harder on any machining blades or bits used to cut, thickness or drill, as well as being harder on the workers using them. If you wish to use recycled materials, discuss it with your design team to make sure they are on board. Designers who work with recycled timber can help you set realistic expectations around cost and availability. Recycled timber can be more expensive to purchase compared to using new materials. And, depending on how you use it, it can also be more labour-intensive to work with, which can add cost to the build. It is also worth speaking with your building inspector. Experienced inspectors will have the appropriate training to visually grade structural timbers. If your use is non-structural, including timber features, flooring and lining, this is less important. There are benefits to using recycled timbers that good inspectors appreciate, such as the stability. “Newer greener timber might bend and bow [as it dries]. And while second-hand materials can be difficult to work with, some of it has been dried for over 20 and 30 years or more,” says Chas McKinna, a building inspector working in Victoria who’s had 60 years of experience in the industry. Recyclers tell us they have never been busier as more households and large corporate clients specify recycled materials for their projects. The move towards commodification of recycled timber needs to be put in perspective though: it accounts for a tiny fraction of the $4.3 billion annual new timber market in Australia. Sustainably sourced new timbers are likely to remain an important component for many renovations and new homes. So, while ‘character and conscience’ is driving much of the consumer sentiment in this area, there is a lot more to specifying recycled timber than being charmed by the story of its prior usage. Find yourself quality design advice and develop a relationship with a reputable recycler. Be realistic. Be specific. Be flexible. What you want may not be available – it is a finite resource after all.